My partner and I recently found ourselves at a popular veggie café, sharing a pallid tofu scramble with squidgy fake sausages, discussing why so much vegetarian fare is inscrutably joyless. Whilst mainstream restaurants in East London’s exploding food scene make a point of showcasing the ever-changing palette of colour and tastes wrought by seasonal produce (but with meat), all too often vegetarian places serve pallid and underseasoned food. Yet there’s no dearth of vegetarian food on menus, which made me wonder if the outdated image of the vegetarian lifestyle was the culprit. This might at least explain why the Hive, located at the top of Vyner Street, doesn’t mention its own vegetarian credentials too loudly. Instead, its website describes “a dining experience designed to enhance your lifestyle…our cold pressed juice detoxifies, our food nourishes, our coffee ignites the senses and our natural wines warm the soul.” If a bit vague, it at least sounds like a good overall outcome for anyone who has been to the pub too many times in the week. The owners take their sourcing seriously. 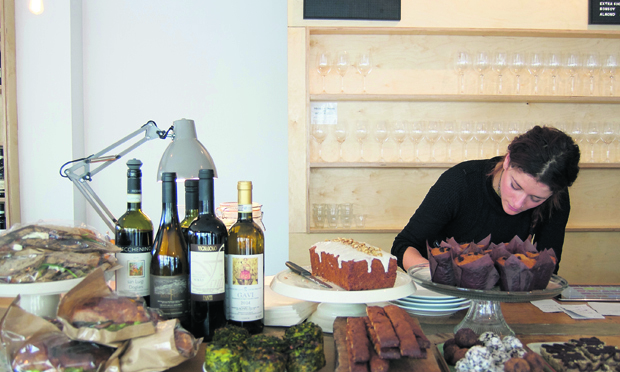 Mainly a breakfast and lunch destination, the Hive serves up coffee from the excellent roastery Square Mile, sourdough from e5 Bakehouse, all natural wines, and biodynamic and organic produce inspired by the Slow Food movement. The foods on offer are enticing and break out of the all too common staid fake meat and dahl framework found elsewhere. Breakfast here could be cashew ricotta cheese, made in-house, and marinated mushrooms on toast, and lunch courgette and squash noodles with coriander pesto. There is limited dairy on offer too. When we sat down on a rainy midweek evening, we turned ourselves over to the chef for food recommendations. These presented themselves as tapas – first a wood board with carefully assembled amuse-bouches, such as a raw mini pizza made with macadamias, and a tempeh and aubergine square. Following that, a stack of grilled vegetables, served to us on a mini barbecue crafted out of a brick and smoking coals. I liked the playfulness of this gesture, full of spontaneity and creativity. For puddings, we were served an all vegan trio of caramel ‘cheese’ cake, lemon tart, and brownie, which were all good verging on great, possibly a bit chewy in the case of the brownie. Finally, there are many cocktails and natural wines on offer. The Hive may rely a little heavily on soya products in its menu currently for my tastes, but it is certainly a place that I would return to, regardless of my diet. My only fear is that its location on the top of Vyner Street may not capture the right kind of passing foot traffic for it to retain a steady evening service. For the full experience, I would stop by for a daytime meal.